Hindu Vedic Astrology (Jyotisha) – predictions help the people to take decisions as per the upcoming situations. And Kundli Matching to find the marriage compatibility between two individuals. Astrology refers to the field of study in which placement and movement of heavenly bodies like the Sun, the Moon & other celestial bodies are analyzed to predict relevant information and events. Astrology has evolved over the years and in different cultures like Chinese and Indian cultures, it was developed as a detailed field of study to make predictions about the various events in Human life. One of the most ancient astrological systems is Western astrology which dates back to 19th to 17th century BC. Vedic Astrology is popularly called as Jyotisha. It is an ancient Hindu astrology method developed by the eminent scholars, Rishis, and Munis. The basis of this old field of study was the Vedas and the old Indian Hindu mythology. It is an integral part of the lives of many people, especially in India. As per Astrology, movement of celestial bodies does affect and influence the life events. And so does the Karma of the past life. Hindus take many important decisions of their lives based on the recommendations by the Astrologers like fixing up marriage, starting a new venture, shifting to a new home. Even the name of a newborn baby is kept as per the recommendation of the Astrologers. The primary purpose of Hindu Vedic astrology is to give accurate predictions based on the thorough, detailed study of Astrology Birth Chart of the concerned person. These predictions, in turn, help the people to take decisions as per the upcoming situations, prepare in advance for the adverse circumstances and plan their day, month or year accordingly. The predictions are given as per the Zodiac sign of the person which depends upon the position of the celestial bodies at the time of his/her birth. Indian astrology by date of birth is the most popular method by which astrologers make an accurate birth chart for accurate predictions. The only requirement is the precise information in order to make a correct astrology report. Many other details like Navamsha/ Bhava Kundali, Ghata Chakra, Avakahada Chakra, Vimshottari Dasha/ Bhukti information is also revealed after a detailed study of your horoscope. At Mpanchang, astrology birth chart calculator is available wherein one can generate their online birth chart by inputting simple information like name, date of birth, time of birth and place of birth. 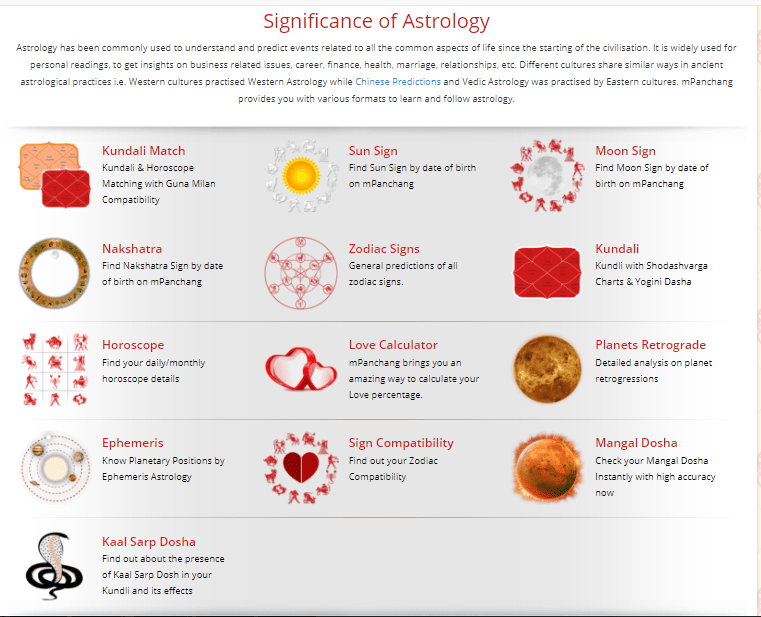 One of the most important aspects of Hindu Vedic Astrology is Kundli Matching or to find the marriage compatibility (Kundali matching for marriage) between two individuals. Kundali of the boy and the girl are matched on the basis of their birth details after a detailed study of the horoscopes of the girl and a boy. It is an important aspect wherein compatibility is studied on the basis of the birth dates of the concerned girl and the boy. The expert astrologers analyze the positive as well as negative aspects and then give their recommendations. If there are negative aspects in your horoscope, they can be rectified. Talk to an Astrologer for detailed guidance on remedies and solutions for the same. At Mpanchang, our expert astrologers give an accurate Kundli Matching Report of the boy and the girl to ensure a successful and blissful marriage.